This St. Patrick's Day card is a pop up design with sliding shamrocks. We can fill this card out for you and send it to the gift recipient along with your order. Please give instructions in the comments area at check-out. When you pull the slide at the base of this St. Patrick's Day card the shamrocks slide. This pop up St. Patrick's Day card from The Irish Gift House is called the shamrock field and the panorama shape measures 4" tall x 9" wide. 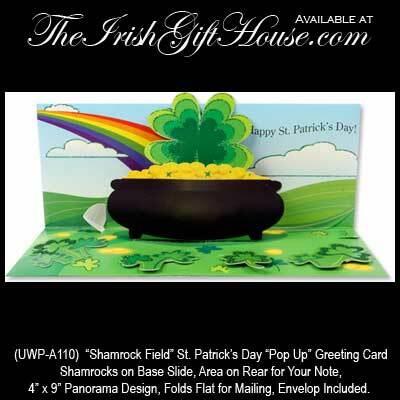 The Irish card with an area on the back for your personal message folds flat for mailing and the envelop is included. It's a St. Patrick's Day Card, a Gift & Decoration, All in One!